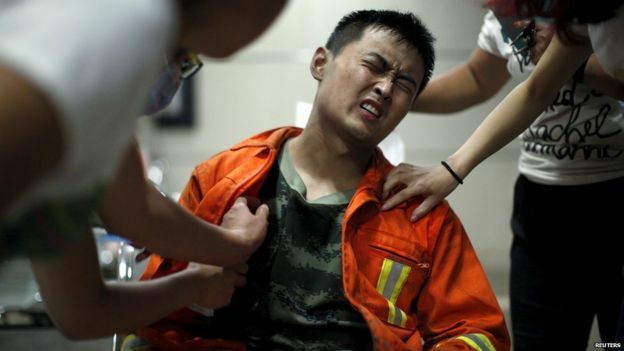 The massive explosions in China’s northern city of Tianjin are now known to have killed at least 50 people. More than 700 have been injured and hospitals are struggling to cope with the number of casualties. The blasts, at a warehouse storing toxic chemicals, destroyed tower blocks and burned out thousands of cars. The fireball could be seen from space. Twelve firefighters are among those who lost their lives; 36 of their colleagues are still missing. President Xi Jinping has promised a thorough investigation into what happened and “transparent information disclosure to the public,” Xinhua news agency reports. 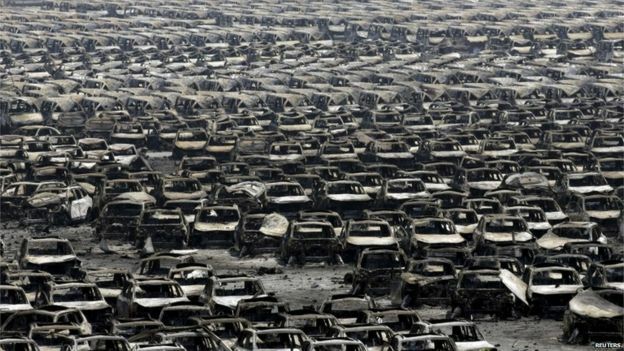 The head of Tianjin’s environmental protection bureau, Wen Wurui, said pollution levels were being monitored. 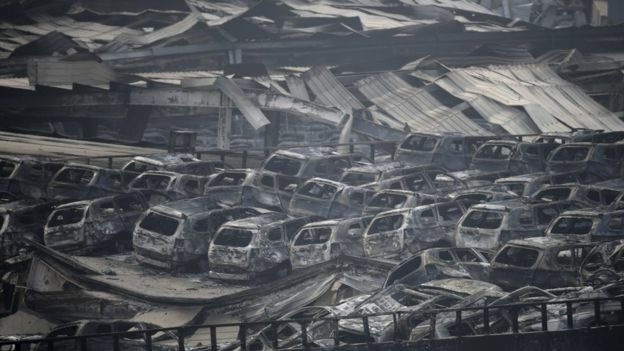 The first explosion occurred at about 23:30 local time (15:30 GMT) on Wednesday in Tianjin’s Binhai New Area, a vast industrial zone which houses car factories, aircraft assembly lines and other manufacturing and research firms. The blast was followed seconds later by another, more powerful blast, and a series of smaller explosions. Buildings within a 2km radius (1.5 miles) had windows blown out and office blocks were destroyed. “I saw fire burning and then: Boom! There was an explosion. My first reaction was to run as fast as I could and get down on the ground to save my life,” Wu Dejun, 38, a hairstylist, told Reuters. The death toll has risen throughout the day and had reached 50 by 19:30 local time (11:30 GMT), state news agency Xinhua reports. Around 1,000 firefighters, along with 140 fire engines, spent the night tackling the flames. A number were reportedly already on the scene at the time of the explosions, having been called out to earlier reports of a fire in the area. Hospitals struggled to cope as residents rushed there to be treated for injuries or for news of missing loved ones. Many without injuries responded for calls to donate blood, and long queues formed outside blood donation centres. 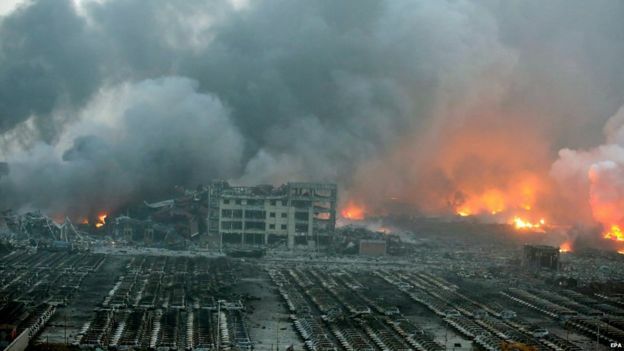 Chinese media has reported that the blasts happened after a shipment of explosives detonated in a warehouse owned by Ruihai Logistics, a company that specialises in handling dangerous and toxic chemicals. State broadcaster China Central Television (CCTV) said at least one person from the “relevant company” had been detained for questioning. There has been some criticism in Chinese media that a warehouse containing such dangerous chemicals should have been sited near a main road, housing complexes and office blocks. Tanker traffic in and out of the port has been disrupted. Are you in Tianjin? Did you witness the explosion? You can share your story by emailing haveyoursay@bbc.co.uk. Please leave a contact number if you are willing to speak with a BBC journalist.